Korir is the Nord Jarl of Winterhold who resides in the Jarl's Longhouse with his wife Thaena and their son Assur. He will generally be found there all day except around 7pm, when he takes his son to The Frozen Hearth for a few hours. 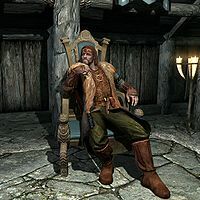 Should the Imperials take over Winterhold, however, Korir will be replaced by Kraldar and he and his family will be exiled to Brunwulf Free-Winter's House, instead of the Palace of the Kings in Windhelm like other Stormcloak-allied jarls. Due to the destructive event known as "The Great Collapse" that had plunged most of Winterhold into the Sea of Ghosts, Korir hates and distrusts the College of Winterhold, as well as its mages (and elves in general, according to his son), accusing them of causing the catastrophe on account of their secretive nature and the fact that the College was mysteriously untouched by it. Like most in Winterhold, he bemoans the city's decline and fervently wishes to restore Winterhold to its former glory. To this end, if asked for work, he sends you to retrieve the Helm of Winterhold, which he believes will help him to gain credibility and respect from the other jarls. Korir wears an outfit consisting of a fur-trimmed cloak, a copper and ruby circlet, a pair of fine armguards, and a pair of pleated shoes. He carries a belted tunic along with a selection of common loot and gold. He may greet you with "I don't care how many Colleges they build, or how much the sea swallows up. I'll outlast them all. ", "You know Winterhold used to be the seat of power in Skyrim? Now it's a shell. ", "Few will admit it, but we know the truth about the Great Collapse. ", "The College is the worst thing that's ever happened to Winterhold, maybe to Skyrim. ", "Those cursed mages... It's their fault Winterhold is gone. ", "What is it now? ", or "You want something?" In exile, Korir will instead say either "Driven out of my own home. After all this, I can't believe it." or "It wasn't enough that the College still stands, now the damnable Empire has Winterhold. I hope they all freeze to death." "I'm here for the College." "Should've known. Not that it matters anymore. No one bothers coming to Winterhold for any other reason." "Stay clear of that College, if you know what's good for you. Nothing but foul deeds behind those walls." "It does. The College has caused enough problems; don't need you or anyone else adding to them. If you're not here for the College, then you've little other reason to be in Winterhold at all." If you have replied that you're here for the College, you can ask him if he has a problem with the College, which he will confirm, "I do, and if you count yourself among their numbers then you've blood on your hands as well. There's nothing left of Winterhold. Nothing! Everyone knows it's the College's fault that the sea swallowed our city. Still they deny it, but we all know the truth." Alternatively, if you have replied that you were just passing through or ask back if it matters, the above dialogue won't be heard. Instead, you can inquire him about what's wrong with the College, and Korir will answer, "Look around you. Winterhold is in this state because of those damned mages. They sit up there in their tower, doing gods-know-what, and who watches over them? The guards don't even dare go up there unless they've no choice." You can also talk to Korir if you'd like to know more about Winterhold's history, though he will not be informative. "What's there to tell? It's mostly gone now, thanks to those damned mages in the College. Someday there'll be proof they caused the Great Collapse. Most of a city just dropping off into the sea... That doesn't just happen." If you're looking for work, Jarl Korir will have a task for you. He'll tell you, "Winterhold has lost much of its history, and with that much of its power. I aim to change that. I've heard rumors of the resting place of the Helm of Winterhold, the very same helm that Jarl Hanse wore in the First Era. Hanse was in line to be High King of Skyrim, you know. Having that might get the ear of the other Holds and give me some authority." If you tell him you'll retrieve the helm, he will reply, "Good. I'll have a sum of gold waiting for your return." If you refuse, saying you don't have the time, Korir will reply, "Then I have no work for you." If Korir is exiled, only the innkeeper Dagur will make any reference to him at all and seems glad to be rid of him, although he is still pessimistic about Winterhold's prospects: "I won't complain about Korir being gone, but I don't expect things to really be any different." Assur: "Eirid says the mages at the College are nice people, but you said they're bad." Korir: "Eirid's a little girl who doesn't understand that they're responsible for destroying our home." Assur: "Why did they do that? Why would they be so evil?" Korir: "Because they don't care about you or I, cub. They think they're better than all of us, and that we can just be thrown away." This page was last modified on 15 March 2019, at 23:31.